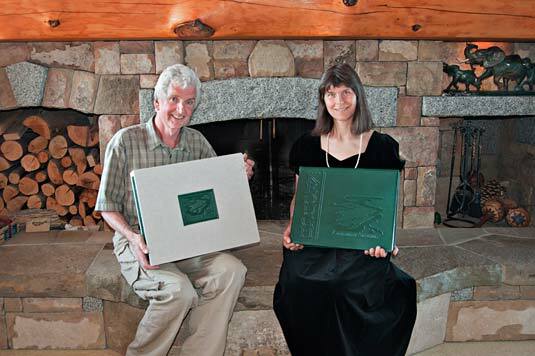 Well, here we are ... in our home, holding one of the Production Proofs of LABYRINTH SUBLIME: Rosemarie with the tome in hand and Pat with the accompanying presentation box. We’re extremely proud! This new work is gorgeous. We can now confirm that the edition size is limited to just 296 tomes. Of these 250 will be signed and numbered; 26 signed and lettered; 15 will be artist proofs; and 5 are the production proofs. Here’s a mock-up of how the limitation page will look. 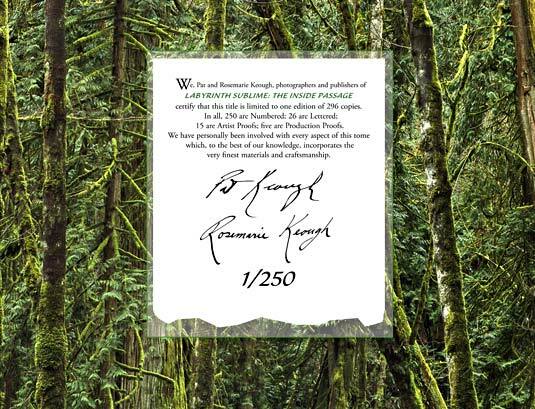 You’ll have to imagine a deckle on the lower edge of the certificate. Right now LABYRINTH SUBLIME is in the skilled hands of the master binders at Felton Bookbinding in Georgetown, Ontario, where Keith Felton, Wilhelm Albiez, and Chris Narayan assisted by Joan Gaffey and Jacqueline Willows are dedicated to our project. This is the same team that bound all 950 copies plus proofs of ANTARCTICA requiring six years to complete the task. The binding of this new work should only take two years assuming the bindery works primarily for us, which may not be realistic — Felton has other clients aside from ourselves. So the binding will take its due course, not being something that can be rushed. Last week we approved the final prototype of the binding, having resolved an outstanding question regarding the thickness of the flyleaves. It is critical that the velvet-covered flyleaf lays flat over the velvet doublure. The joint needs to be flexible but beyond the first inch from the spine, the flyleaf must be quite stiff. Should the flyleaf not be quite stiff enough, the friction of the velvet on the two facing surfaces could cause the flyleaf to catch, possibly buckle and be creased by the weight of pages as they are turned. This issue has now been addressed with full satisfaction, as you’ll see when you open your own book. The other correction was to the spine die. Believe it or not, it came to light during the first two production proofs that the title LABYRINTH SUBLIME as debossed on the leather spine of both the book and the presentation box was misaligned by 1/4" vertically as compared to the debossed title ANTARCTICA on that book and box. We intend the titles to match one another. Frank Bonigut, our die maker, retooled the two brass dies affected to match the artwork we originally supplied. These details are but a few of the great many to which we pay close attention. Presently at Feltons, the leather covers for the first books are being made — a very involved series of steps all accomplished by hand. Also the book blocks are being hand sewn about linen tapes stretched over a sewing frame, in time-honoured fashion. The preparation of the endleaves and flyleaves with the attached leather joints is yet to begin. Keith Felton is awaiting special skiving knives to arrive from Scotland with which to pare the underside of the leather (to ensure a smooth fit onto the flyleaves). The knives were shipped almost two months ago, only to be caught in the Canadian postal strike. This hasn’t delayed progress though, as there is plenty to do! At Feltons, our high expectations are well understood and consistently exceeded. As such, we’re able to take a bit a breather and find enjoyment in being at home, entertaining guests, gardening and just being connected to the outdoors again. Certainly, the first half of this year was a long haul indoors! Meanwhile back in Manitoba at Friesens, the staff at Specialty Packaging have recently completed three additional prototype presentation boxes just prior to the plant’s two-week summer shut-down. Having thoroughly inspected these linen-and-velvet clad boxes we’re very close to approving final specifications to the 1/32 of an inch. We anticipate that the next prototype, to be available end of July, will be approved. Photos will soon be forthcoming of the making of the presentation boxes so that you can understand and appreciate the complexities. We want a tight fit to prevent movement of the book during shipment, but not too tight so as to encumber the ease of taking the book in and out of the box. At our studio on Salt Spring Island we’re now putting our minds to redesigning our website so as to showcase both LABYRINTH SUBLIME and ANTARCTICA. Also, we’re soon to begin strategizing how to promote and sell the new work. Happy Fourth of July to our American Collectors and belated Happy Canada Day to fellow Canadians! Happy Summer everyone! We’ll be back in touch soon again.